(CNN) -- AC Milan's slim Serie A title hopes remain alive, after Sunday's 2-0 victory at Catania closed the gap on city rivals Inter to seven points, with four matches and a possible 12 points still remaining. 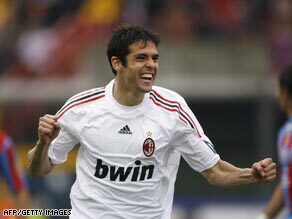 Kaka celebrates scoring Milan's second goal in their 2-0 victory at Catania on Sunday. However, despite goals from Filippo Inzaghi and Kaka giving them a comfortable success on Sunday, Carlo Ancelotti's side would need the defending champions to suffer an unlikely collapse to secure their first Scudetto since 2004. Milan took the lead in Sicily in the 27th minute when Kaka burst into the area before teeing-up veteran striker Inzaghi for the 11th goal in his last eight matches. The visitors' second goal came early in the second half when Kaka prodded home his 15th goal of the season from close range after David Beckham's header was only parried out. The victory was Milan's fifth in a row, a run of form that contrasts sharply with third-placed Juventus -- whose title hopes mathematically ended as substitute Jose Ignacio Castillo scored an equalizer deep into injury time for relegation-threatened Lecce in a 2-2 draw in Turin. Ivory Coast forward Axel Konan gave Lecce an 11th-minute lead after beating the offside trap, but veteran midfielder Pavel Nedved scored twice after the break to set Juve up for their first victory in five matches. But Castillo's late header from a Simone Tiribocchi cross stunned the home supporters, who made their feelings known by jeering their team off the pitch. Lecce remain second bottom after the draw, but are now only two points from safety. Fiorentina maintained their grip on fourth place and the final Champions League qualifying position as Peruvian full-back Juan Manuel Vargas scored the only goal of the game in a 1-0 win over Torino. Meanwhile, Roma's top four hopes look over after they were held 0-0 at home to Chievo, leaving them eight points behind Fiorentina with four games left.